I started my Workspace residency at Dieu Donné without a specific end goal in mind. Instead, I wanted to see how paper pulp worked as a sculptural material and to experiment with pigment. Everything about the mill was new and fascinating – the raw cotton, the beaters, the screens, the press and the pigments. It was refreshing and exhilarating to be offered a chance to have a purely experimental approach yet simultaneously be expertly guided in using a new material. My first day was material testing; casting, hand building, and playing with pigments. We also tried using objects from my studio practice, jazz shoes, pieces of wood, fabric and rubber molds. 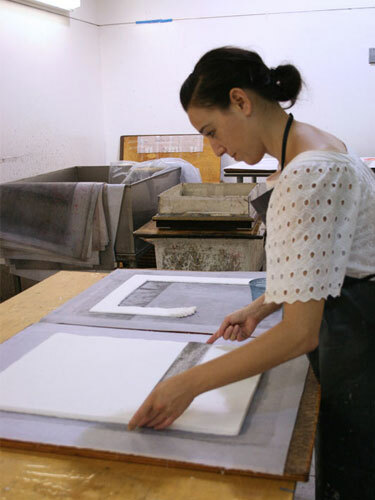 I was quickly drawn to the process of using pigment with objects in the press. There was an uncontrollable element that was exciting and I enjoyed having a limited influence over the outcome of a singular print. There are lovely moments at Dieu Donné where working feels like the weather – water pouring off the press, surprising streaks of pigment, and small mountains of discarded pulp. The series of mono-prints and reliefs made during the residency naturally have a direct relationship to my sculpture work. I am drawn to transformations from action to stillness in form and how this is mirrored in materials. Paper pulp does this in a dramatic way, with a corporeal physicality when wet and drying rigid as stone. I loved how it could be used both wet and dry with the pulp able to take in both liquid and solids. Wet pulp pressed with materials and pigment dries to become collage pieces and returns again to the press imbedded into more wet pulp. 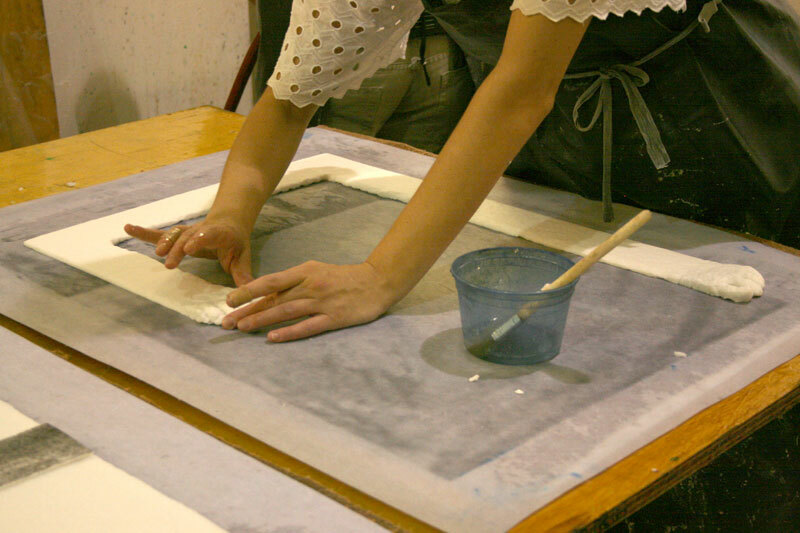 The working process felt like its own natural cycle, one that will continue to be integrated into my studio practice. I would like to offer a heartfelt thank you to Paul Wong for his generous collaboration, and to Kathleen Flynn, Rebecca Lax and Jessica Svenson for their input and support. Jennifer Paige Cohen is a sculptor living and working in Brooklyn, New York. She received her MFA from Yale University School of Art.